Sports journalism has historically been a difficult area for women to enter and to be taken seriously. While there are a handful of established female sports journalists – Jackie MacMullan, Sally Jenkins, Judy Battista and Doris Burke come to mind – there are far more than haven’t broken down the door, and it’s not for fault of their talent. We, as a society in the 21st century, would like to believe that sexism and gender equality have progressed from where they were a few decades ago, but the truth is there is a great deal of work still to be done. In fact, in August 2016 research by Professor Suzanne Franks and Deirdre O’Neill at City University London and University of Huddersfield found that there has been little improvement in the past decade for women working in the field of sports journalism. As recent as the 1970s female reporters were not allowed to interview players in the locker room before and after games, leaving their male counterparts with a distinct advantage. It wasn’t until 1978 when Sports Illustrated reporter Melissa Ludtke sued the New York Yankees who had banned her from entering the locker room to interview players during the 1977 World Series. A federal judge decided that the practice of banning female reporter was in violation of the Equal Protection Clause of the 14th Amendment. Ludke won the case and quite literally, opened up the doors for female sports journalists around the country. However, even though laws can change in a day, social behaviors and attitudes can’t. Despite the cultural barriers being broken and women now able to enter locker rooms, these journalists were faced with hostility and angst while doing their job. Unfortunately, on multiple occasions male athletes have been known to drop their towels as a way to taunt female reporters during interviews; this has happened many times to Kristine Leahy and others amounts to sexual harassment. There needs to be a change in the way reporters and athletes interact post-game; regardless of gender, reporters should not be walking into locker rooms and there should be a better way to hold post-game interviews. There is some dissension in the ranks of female reporters about locker room access. Some, including ESPN Suzy Kolber, have advocated for a neutral spot outside the locker room for all post-game interviews, after players are allowed to get showered and collect themselves. While others think this would remove the raw emotion ever-present directly after a game is completed. The only right answer is one that includes a level playing field regardless of gender. In 2014 it was found that gender imbalances are present across print, broadcast and online platforms in sports journalism. Men and especially Caucasian men, greatly outnumber women. A report found that despite all efforts to achieve equality among gender employment the numbers were still dismal. Female reporters and journalists continue to be critiqued more on their outfits and physique than on their knowledge of sports. In fact, Meredith Vieira was the first woman to ever host the Olympics sports coverage in 2014. An Associated Press Sports Editors-commissioned report by the Institute for Diversity and Ethics in Sport found that there was an increase in women of color sports journalists, but there still weren’t enough female columnists and editors. The majority of female columnists and editors worked for ESPN, which had actively made an effort to diversify its newsroom. Without the changes made by ESPN, the figures would be much worse. 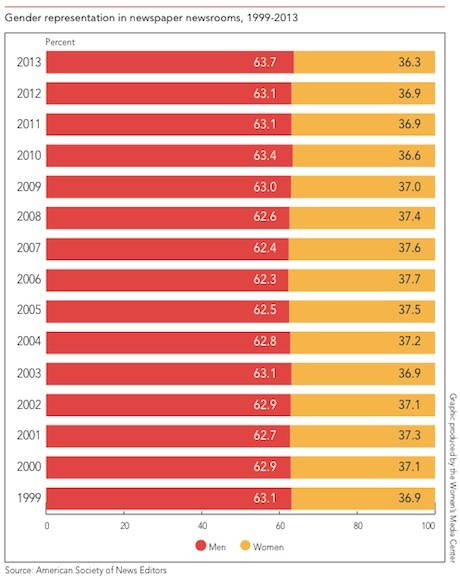 As the following statistics from 2012 show, 90 percent of sports editors are white and 90 percent are male. The few female sports reporters who get a chance to work in the sports media, or appear in front of the television in any way, have to deal with regular sexist works such as the “50 Hottest Female Sports Broadcasters from Around the World“, which does nothing to improve the seriousness with which female journalists should be taken. In fact, it makes you question the journalistic sense of the publisher – we’re looking at you Bleacher Report. Sports journalists are also faced with harassment from fans, the athletes themselves and even their own colleagues. A prime example of this was seen in 2010 during the World Cup in South Africa. When Spain played their first match against Switzerland in Durban, they lost 0-1, and as soon as the match ended, the Spanish press (and social media) blamed this defeat on one person: Sara Carbonero, a TV presenter who was reporting on the match from the field. Carbonero also happened to be the girlfriend, now wife, of Spain’s goalkeeper, Iker Casillas. Fans blamed Carbonero’s presence as a distraction for the goalie and many made unrelated remarks on her lack of professionalism and how she could not be a proper journalist because of her beauty. It was seen as impossible for an attractive female presenter to be good at her job. The online arena is a dangerous one for women who work in sports journalism. This is one area where women who work in male-dominated fields are especially targeted. While male sports reporters are also subjected to insults through social media, women are more vulnerable to malicious online attacks. If young female journalists feel they will face sexist abuse online, they will be less likely to want to enter the field, as this is an industry where public profile and reader interactivity are increasingly important. According to a 2014 Pew Research study women are more likely to be exposed to sexual harassment online (25 percent of women to 13 percent of men) and stalking (25 percent of women to 7 percent of men). Top female journalists writing for UK national newspapers such as the Guardian, The Sun, The Times were questioned on their experiences working in sports journalism. As a society we are not in the clear when it comes to issues of sexism and gender inequality, especially in sports journalism where there is still a long way to go. The Life of an Instant Replay Operator – How Did This Happen?